We are sorry to announce that there was a problem with our website, which resulted in unsuccessful downloads using the valid licence key on download cards sold at DLsite.com / Nijiyome booth in Creative Paradise 04 (19th ACG HK 2017). The problem has been fixed around 3 p.m. (local time in Hong Kong, UTC +08:00) July 29th; so those of you who have encountered an error upon entering the licence key on your card, please try using it again on the [ Enter the License Key ] page. We apologize for those who have shopped with us at our booth and have been affected by this problem. If you have any questions or need assistance regarding the download cards, don't hesitate to contact us via our [ Help Page ]. Meanwhile, Creative Paradise 04 is open until July 30th at Hall 3 of Hong Kong Convention & Exhibition Centre. We hope to see you there! [ Creative Paradise 04 ] (19th ACG HK 2017) that takes place from 28th to 30th July 2017 at Hong Kong Convention & Exhibition Centre, Hong Kong. 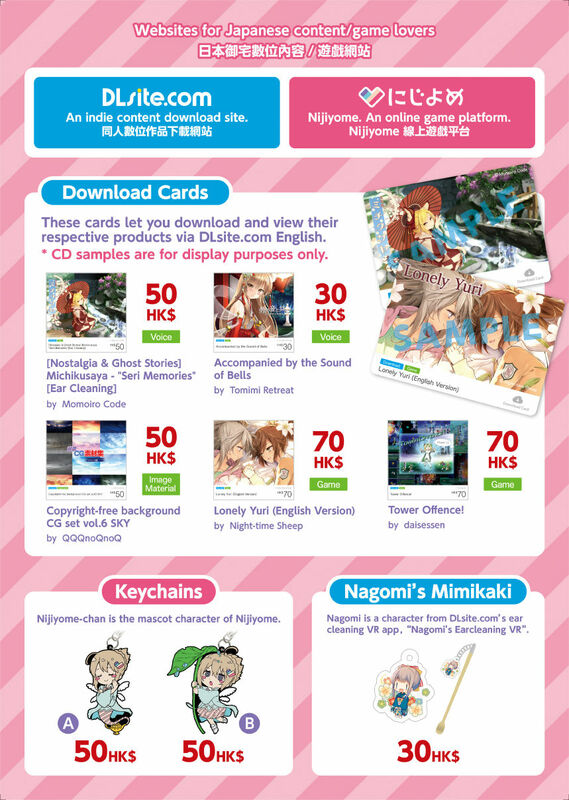 As DLsite.com English and Nijiyome, we will be selling some download cards that will let you download and view the products via DLsite.com English, and a few merchandises of Nagomi's Earcleaning VR and Nijiyome. Come and visit us if you are planning to take a trip to 19th ACG HK 2017!